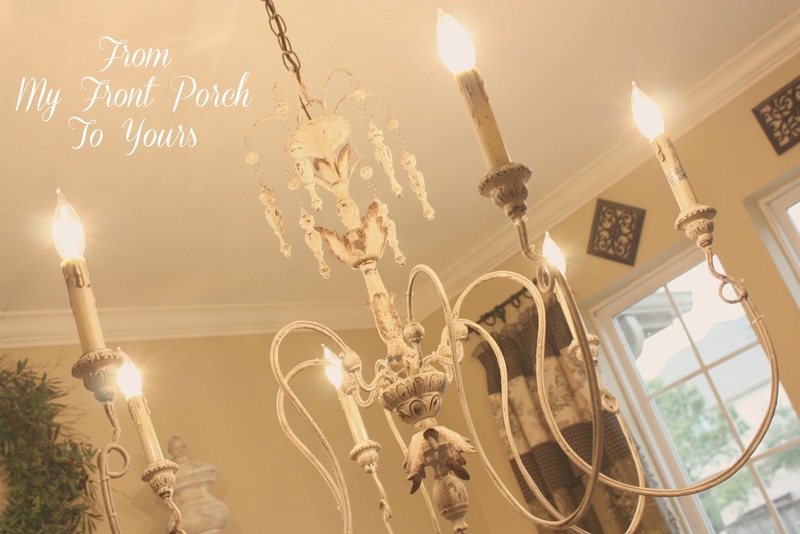 Yes, you read that right I said $43 for a Frenchy chandelier! A few weeks back in the midst of our laundry room makeover I came across a set of French inspired light fixtures on the local yard sale site. You can imagine my joy when I saw that the seller was only asking $100 for the chandelier and two sconces. I just knew they had to be gone but I called anyways. Turns out the seller lives in my hood so I drove right over to look at them. She actually is moving and these were in her new house. Though lovely she thought they did not fit in with her style. She had no idea what they were worth and had just told her hubby to throw um up on the yard sale site to get um out of the way. Being a chandy lover I knew this style of lighting cost quite a bit even the inexpensive versions. I ended up getting the set for just $86! 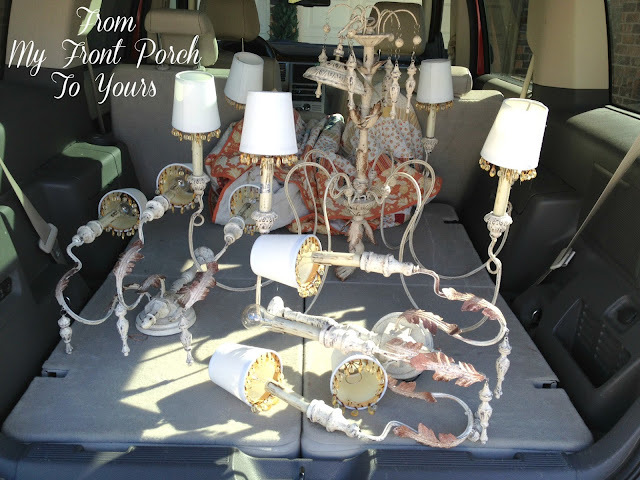 That breaks down to $43 for the chandy and only $21.50 for each sconce. I could not believe it and at the time I had no idea where I was going to be using them but I knew they had to be mine. After I got home I did some research and found them online. All three would have cost me over $700! 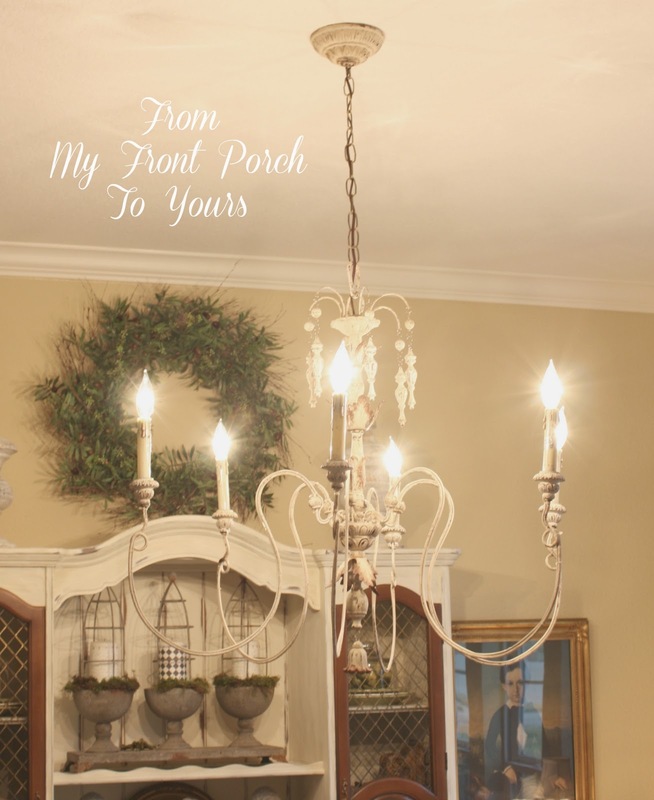 Originally I had wanted to hang the new chandy in our stair landing. In the end I decided to steal the current chandy that was in our dining room and place it in our laundry room. 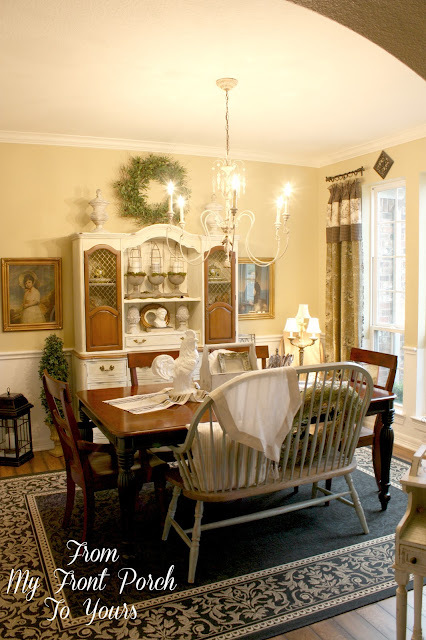 I always felt that it was a tad small for the dining room to begin with and well the new chandy was plenty big enough. The stair landing could wait. I decided not to use the ceiling medallion with it because it has such an ornate ceiling plate. I love the patina and thus was thrilled I was not going to have to update the finish. I think the new chandy fits the dining room space so much better. Though I love the new chandy it is missing something. Can you guess what it is missing? Something that I just love and so I was trying to figure out how I could add it. I ended up finding this inspiration pic that has a chandy with a similar patina and bling! I knew I had to order some bling. 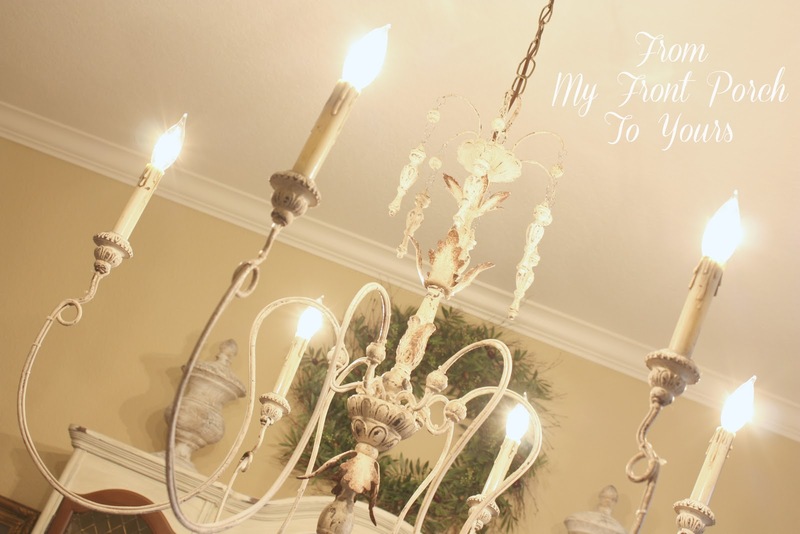 I can not wait to add bling to this chandy. I think it will be just fabulous. Be sure to check back by for another change coming soon to the dining room. It certainly is a beauty...I am now a new follower! I love it!! It is gorgeous!! What a fantastic chandi! It's just perfect in your dining room. Wow, holy cow, what a find! It is incredible. What a score, Pamela. It is very similar to mine. It looks great just like it is. You scored! I think dinning room looks much better with the scale of Chandelier......LUCKY! It is perfect for that space! And aren't these the best kind of steals? Great score!!! Oh my you lucky duck! That chandy is gorgeous!! I'd love it if you linked this to my new linky party, "What We've Accomplished Wednesdays," tomorrow. Pamela, I can't believe you found one so quickly and at such a deal! I am happy for you. It looks fantastic. Just perfect for that space!! Now that is an amazing find!! 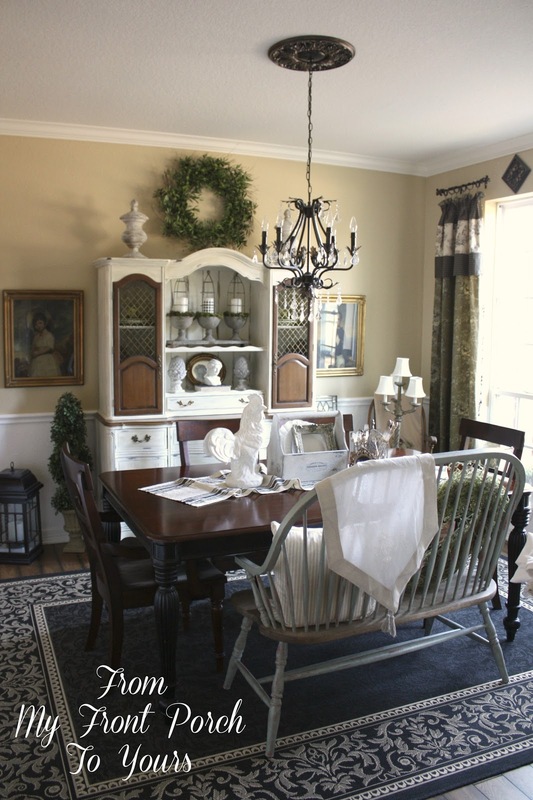 It's gorgeous and perfect in your dining room!! Great find, and I love how it fills your space! Whoa, you hit the motherload! I want you to know that I just purchased the exact same chandelier on Amazon for $299! That was the cheapest price for it that I could find! It is EXACT in every detail. And I love yours as much as I love mine. Glad you were able to find them. 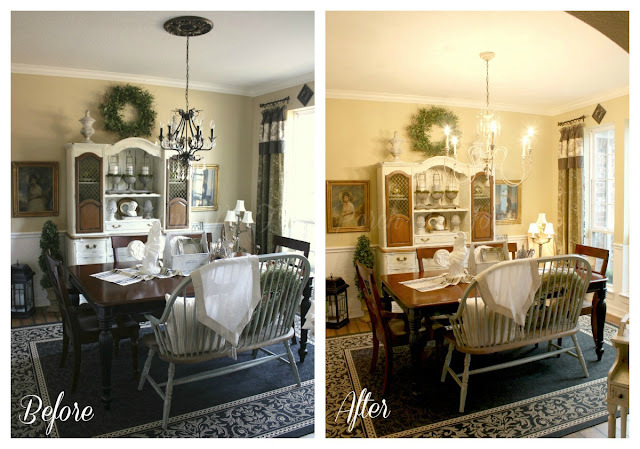 I just hung a chandy with that bling in my dining area (see last blog post), but I think I love yours even more - ESPECIALLY for that price. That is a beauty, and it transforms the entire room!! 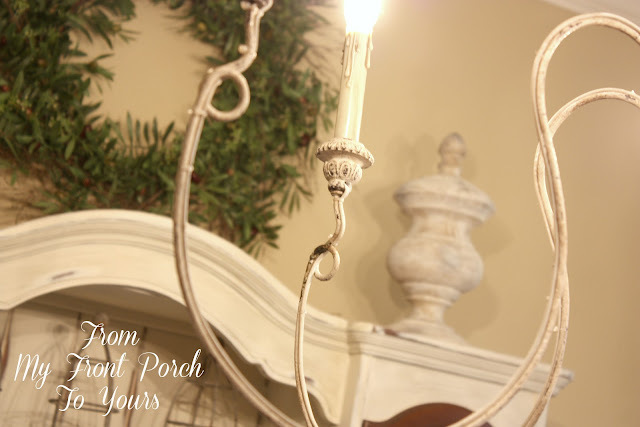 A beautiful Chandy... It's perfect over your dining room table. How beautiful! I love your thrifty find! Why can't I ever find a reduced chandelier...they are just not in my area. Lucky girl! Love, love, love it!!! Great find and I think it looks perfect in your dining room!!! What a great find, this is beautiful! I love the patina too. Can't wait to see it when you add some bling. It is grogeous with your dining room furniture. Oh Pamela. How lucky were you! That is quite a fine. A beautiful find to boot. It's just beautiful. Gorgeous, Pamela! I love the size and the color! Oh, it's going to look great with a little bling on it. I think it worked out great that you moved the previous fixture to the laundry room. How beautiful. I can't wait to see it when you are finished adding the bling. Huge score for you! It is gorgeous! What a difference. Looks sooo F A B U L O U S! Nice score! Good for you. It looks beautiful in your dining room. It goes perfectly with your furnishings. Wow! I'm jealous. I can't believe how little you paid for that beauty! It looks perfect in your dining room and is a better size than your other one, I believe. That lady had no idea what she gave up! Pamela, this was the deal of a lifetime as they say, I would be on cloud nine if I found these. Beautiful! What a great find and it looks beautiful! Cha-ching! What a steal, girl! I think I am the one who needs to come shop with you! 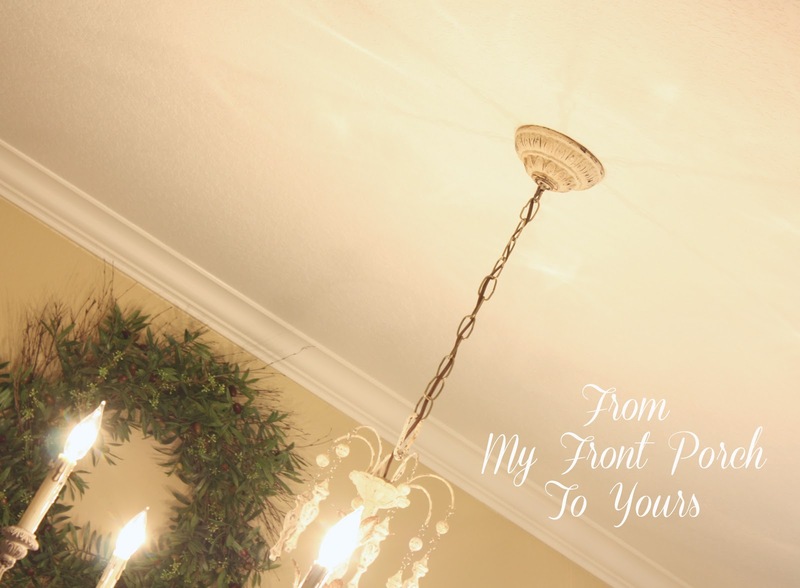 Love it for sure; it's perfect in your dining room! It looks beautiful!!!! Yes, keep us posted when the bling arrives! Wow! You got the deal of the year! 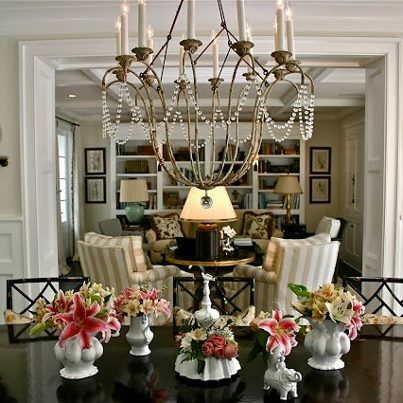 That chandy and the sconces are just divine. It looks like the arms have the perfect loop to put some bling on them. Congratulations! Whoa what an amazing price and beautiful too! Looks perfect in your dining room.Oh adding a little bling will look gorgeous too! Oh this is just perfection! It looks fantastic! You are right, the bigger one fits better. Love it and what a steal! Lucky, lucky! Looks great and really suites your style! Really gorgeous! What a transformation. I love it! 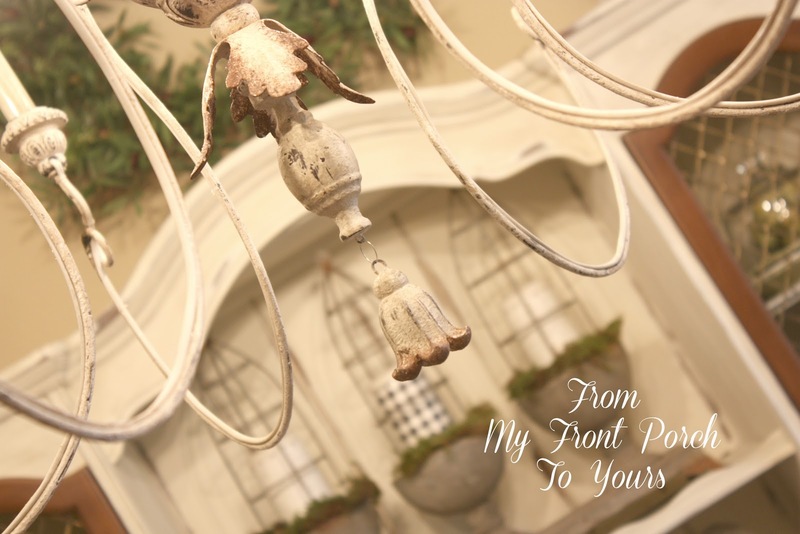 Come and link up to Centerpiece Wed and share this post with us. Girl, what a find!! Your new chandy is PERFECT in the dining room! i'm so envious! they're beautiful and even more special because of the low price! great snag, pamela! FABULOUS chandelier!! It looks gorgeous in your dining room. What a steal!